Leukemia was the first cancer to be observed in children from Hiroshima and Nagasaki. In continuing Atomic Bomb Casualty Commission studies on survivors for sixty years and continued by the Radiation Effects Research Foundation, children in comparison with older individuals have developed increased susceptibility to other forms of cancer. 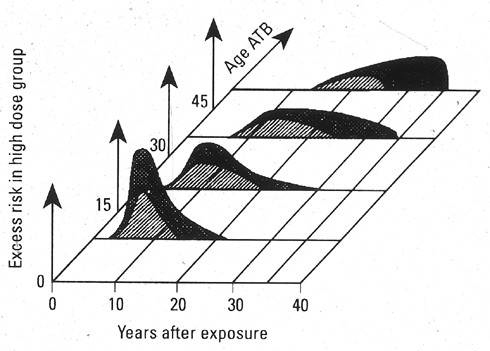 Diagram of the leukemia frequency among atomic bomb survivors by age at exposure, latent period, and city (Hiroshima, black; Nagasaki, hatched). ATB, at time of bomb.